Readers may remember the news breaking earlier this year about the author Chuck Palahniuk being robbed of several million dollars worth of royalties by his agency. Palahnuik was not the only victim of the agency’s bookkeeper. That agency has filed for Chapter 7 protection, because the bookkeeper skimmed royalties from Palahnuik, Edward Gorey’s Estate, and others to fund a corporation that did good works . But I Pay all my Bills on Time! Yes, but what happens when your publisher doesn’t? Medallion Press has filed for Chapter 7 bankruptcy. That means it is going away, never to be seen again. As I was preparing for today’s post, I cam across a couple of things I thought I’d share. The first is a perfect example of one of the problems facing traditional publishing today. The second is a post about why it’s a great time — sort of — to go indie. Both are, in my opinion, things we need to think about. Last week, the Buffalo News posted an article about Gov. Andrew Cuomo. No, it wasn’t about his politics. Instead, it was about his book and how much he’s made — and how many copies the book has sold. But before we get into the finance aspect, a little background. Cuomo was elected governor of New York in 2010 and took office January 1, 2011. His book, All Things Possible: Setbacks and Success in Politics and Life , was published by HarperCollins on October 4, 2014. Even assuming HarperCollins pushed to get the book out as quickly as it could, I doubt they had the book for less than a year before publishing it. So, at most, Cuomo had been in the governor’s mansion for two years when the book came out. And this is where things get interesting. Now to the money. According to the Buffalo News, Cuomo has made, to date, $783,000 for writing his book. The publisher is reported to have laid down a first run printing of 200,000 copies of the book. Now, based on all that, you’d think the book sold well, possibly going into second and third printings, right? The book has sold approximately 3,200 copies since publication. As of the time I’m writing this post, the hard cover price is $8.45, more than a buck less than the e-book price (which is still set by the publisher at $9.99. More on that in a moment). It is more than fair to say the book tanked. HarperCollins basically through Cuomo under the bus for the poor performance of the book back in 2015. It seems Cuomo didn’t tour to promote the book and turned down media appearances. They were surprised, I tell you, surprised. They thought he would do at least some promotion. That, it seems, is one of the main reasons the book didn’t sell as expected. Riiiiight. Putting on my cynic’s hat, I could say HarperCollins never really expected the book to sell. They paid all that money to Cuomo as a legal bribe. But that’s the cynic and I have no proof of it. However, I’m not the only one that thought came to. Google the book and its poor performance and you will see a number of others who have thought the same and have made no bones about it. Taking off my cynic’s hat, this poor performance is indicative of some of the problems in traditional publishing. HarperCollins didn’t consider the fact Cuomo isn’t all that popular outside of New York. Considering the low sales numbers, I wonder if he is all that popular outside of NYC. They made the mistake of paying on inflated and unrealistic expectations just as they did with the initial print run. As for the promo claim — or should I say no promo? — pardon me while I laugh. I’m sure if you asked Cuomo, he would say HarperCollins didn’t promote the book that way he thought they would. They expected Cuomo to do the promotion. Welcome to the world of publishing. Publishers, at least some of them, promise to promote a book and their idea of promotion is not the same as the author’s. The long and short of the story is, however, a simple one and it is a cautionary tale. Publishing cannot continue to pay huge advances and guaranteed payouts to political darlings and Hollywood-types, giving them outrageous initial print runs without doing at least a simple market review first. How much money has been lost by traditional publishing houses like this? More importantly from a writer’s point of view, how many mid-list writers, those who have pretty much guaranteed sales of a certain figure book after book, have been dropped because publishers feel they can’t afford to keep them and how often has this happened AFTER a book has bombed by someone like Cuomo? Next up is this post about why it’s a great time to be a writer, sort of. I’ll leave you to read the post but the short version is simple. If you want to go traditional, not much has changed. You can keep slogging for months and years, trying to get your work picked up by an agent and then on an editor’s desk where you can hope to get a contract. While there is nothing wrong with this, the length of time it takes to break in this way is a negative, as is the declining number of bookstores. Then there’s indie publishing. That’s the great part. If you have the drive and you have a book finished, you can publish it now. There’s no waiting to shop the book around, looking for an agent and then a contract. You make it the best book you can, slap a cover on it and push the publish button. Of course, there’s a but. There’s always a but and that’s where the “sort of” comes in. To be successful as an indie, you have to work at it. You have to take on much of what the traditional publisher does. You have to make sure your book has a great cover, is well formatted and edited. You have to market it. You have to do the accounting and pay the taxes. In other words, you have to remember that this is a business. It’s a lot of work and there is no guarantee that you’ll be a “success”. However, there is an advantage in that you aren’t at the whim of a traditional publisher, held to releasing a book only according to their schedule. The decision as to what is best for you is, of course, up to you. Now, since I’m an indie, here’s a bit of promo. Plots form, betrayals are planned and war nears. Give me my advance back! The other day, someone asked me if publishers ever ask for their advances back. After all, there have to have been times when a publisher has signed a contract with an author and that author failed to deliver. I told the person asking that yes, publishers do sometimes ask for their money back. But the instances that came to mind weren’t where an author failed to deliver a book. No, the examples I remembered were where the publishers determined, usually after a public outcry, that the book delivered wasn’t what they thought it was. There have been situations where plagiarism has torpedoed a deal or where a newly signed author wound up having her contract canceled because she dared self-publishing something totally unrelated to the contracted book. Despite all that, I simply could not remember a situation where a publisher had demanded an advance back from an author for not delivering a book and certainly not from a best selling author. Now, that’s not to say it hasn’t happened before. I simply couldn’t remember an example. So imagine my surprise when I went over to The Passive Voice this morning and found reference to a law suit filed by Hachette against Seth Grahame-Smith (SGS for future reference). SGS, in case you aren’t familiar with the name, is the author of Pride and Prejudice and Zombies: The Classic Regency Romance – Now with Ultraviolent Zombie Mayhem! and Abraham Lincoln: Vampire Hunter . We have him to thank for other re-imaginings of classics like Sense and Sensibility and Sea Monsters . I think you get my drift. PP&Z was a fun romp but the originality quickly wore thin as SGS and others took public domain books and reframed them with one sort of monster or another. So let’s fast-forward to Hachette’s lawsuit. I urge you to click on the link and read it for yourself. It isn’t all that long and it does illustrate some of the issues both publishers and authors have to work with when entering into a contract. From here on out, remember that what I say is just me talking as a reader and a writer, not as a lawyer. Since I haven’t yet seen a response fro SGS, for the purposes of this post, I will assume that the basic facts — dates, etc — alleged in Hachette’s filing are correct. December 2010 the contract was executed. The contract was for two books. $500,ooo advance per book paid upfront with the remainder of $2,000,000 per book to be paid. Book 1 was to be a sequel to Abraham Lincoln: Vampire Hunter . 60 day grace period after the expiration of contracted deadline or agreed upon extensions during which SGS could deliver the books. After which, the contract could be canceled. June 6, 2016, SGS delivered Book 2 but Hachette claims it was not the agreed upon Book 2 and that it was not “original” work but derivative ala PP&Z. Hachette wants its $500,000 back as well as all other reasonable fees as laid out by the contract. O0kay, with me so far? Now, from a business standpoint, you want folks to deliver what they have said they will and you want it in a timely manner. After all, you have customers who want the product and you can’t deliver it to them if you don’t have it. That seems simple enough. But this is where I have to look at publishers and scratch my head. Can you imagine your local grocer or Wally World contracting with a supplier to deliver something but they don’t know what? Oh, sure, the contract says you have the right to say no when they finally come to you and you decide it isn’t want you want. But de-amn. Think about the inventory headaches that would cause. Here’s a publisher happily writing a check for half a mil without knowing what the book is going to be about. Nope and nope and nope again. One line in the pleadings stood out and this is where my writer’s back went up. Book 2 was to be “comparable in style, quality and broad appeal to Abraham Lincoln: Vampire Hunter .” How do you define that? It is such an objective requirement that it would be easy for a publisher to use it as reason for rejecting a book. But then, as one of the comments at TPV pointed out, this is SGS we’re talking about. He made his reputation by taking public domain works and re-inventing them. I’ve read both PP&Z as well as Abraham Lincoln: Vampire Hunter. PP&Z is very much taking Austen’s original work and simply adding zombies to it. You can lay the two books side by side and see how he did it. While entertaining, ALVH is, in its own way, derivative, more as an idea than by taking another book and simply re-purposing it. So why Hachette would expect anything else from him is beyond me. But, going back to the original question, yes, there are times when publishers ask for their advance back. With traditional publishing facing the challenges it does right now, I have a feeling we are going to see more and more suits like this. Traditional publishing simply isn’t in the financial position to allow authors to sit on money and not deliver manuscripts, at least not when the advances are six-figure or higher. On a closing note, I once more recommend you read not only the filing but the attached contract. I haven’t had a chance to study it as closely as I want but I will before next week. From what TPV noted, it is a good example of some of the things he, as well as Kris Rusch, have been warning writers about for some time. So, what do you think, based on the filings, etc., is Hachette right to ask for its money back? I’ve always said that unity and broadness in sf/fantasy were a net positive for the very people doing their best to narrow and Balkanize it. Publishing, and the whole writing world is reflective and reactive to the wider world. Its battles are small but they are the echoes of a conflict outside, particularly in the US. And, in my dispassionate outsider’s view, as a fairly moderate sort of guy who fits no political party well, but finds the modern Left worryingly authoritarian and totalitarian… The US is more divided than I’ve ever seen in my twenty odd years of watching. Yes, it has been divided before, but this time there are disruption factors that just weren’t there before. And the same is true in publishing, and in sf/fantasy. Before, there were a few large publishers to push things back in line, and basically to ensure that it was unity or… exile and death (at least as published author). So while there were little Balkans in the closed circles of the cons and fans, not a lot of that seeped beyond. That began to change when the Publishing Industry became predominantly left wing, along with the media, with whom it enjoyed close links. With distribution and bookshops generally in thrall, it stopped being an in-house game – at least for the dominant group. You had a plethora of bloggers and media stables (the Gawker group was a frequent player), as well as reviewers from Locus to Radish reviews all pushing doctrinaire books, and either trashing or not covering the ones that didn’t live up to their narrative, either in the author’s public stance (Orson Scott Card) or content. Aggregator sites – File 770 — skewed coverage further, elevating their ‘side’ and either ignoring the other or deliberately spinning it as negative. Now, I am sure they didn’t plan this: they were just in control, and promoting their own. We’re not talking of deep thinkers or clever conspirators. If the bias got pointed out to them, they are experts at rationalizing it away, and claiming the end justified the means, and that they were doing it for everyone’s good. The non-dominant group went on being polite about the Left’s books, buying them and reading them – they had no real alternative. Basically access and sales to the left were closed to them. The center and right were painted as inferior, bad and awful (to quote some actual words used). The right and center had little choice but to put up with this. 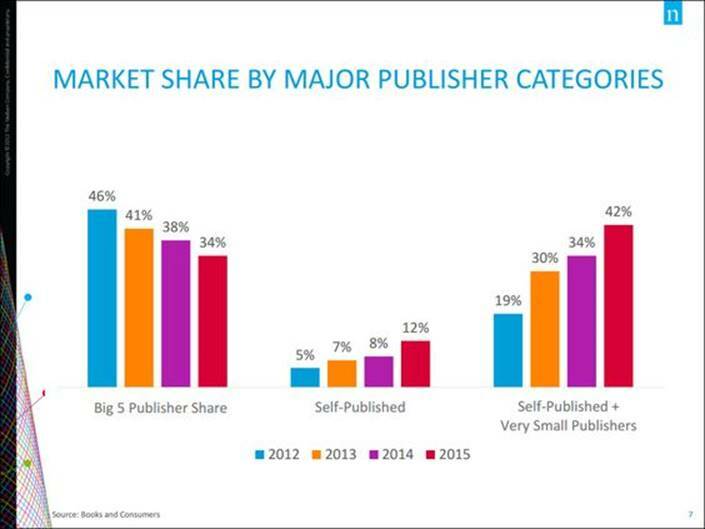 Traditional publishing in the US (and I believe the same in UK and Australia) skews hard Left. I know, Camestros will go into denial loops, but the industry is essentially Left wing, Historically they controlled access, sales outlets, and distribution, media, critical assessment. The result of that politically dominant position has been mirrored in buying choices – which authors were bought, which authors were heavily promoted, which authors got book-tours etc. Of course they tended to buy books whose world view and therefore politics tended to reflect their own. At a conservative estimate I’d say that 9 out of 10 authors published by traditional publishing in the last 10 years are left wing, and often overtly so. It’s slowly been drifting that way for at least 50 years. 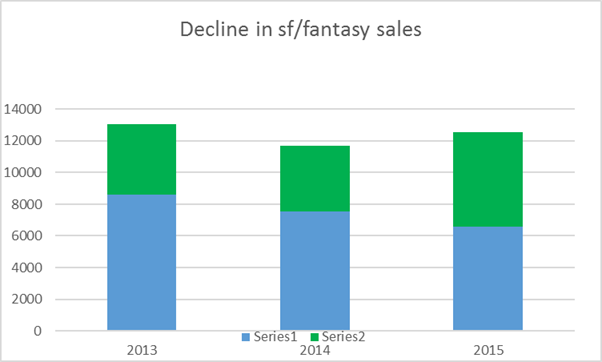 and sf/fantasy in specific have been on a rapid decline. Looking at the last three years – data from Nielsen via PW. At the same time serious disruption factor – in the shape of e-books and Amazon as a distributor changed everything. 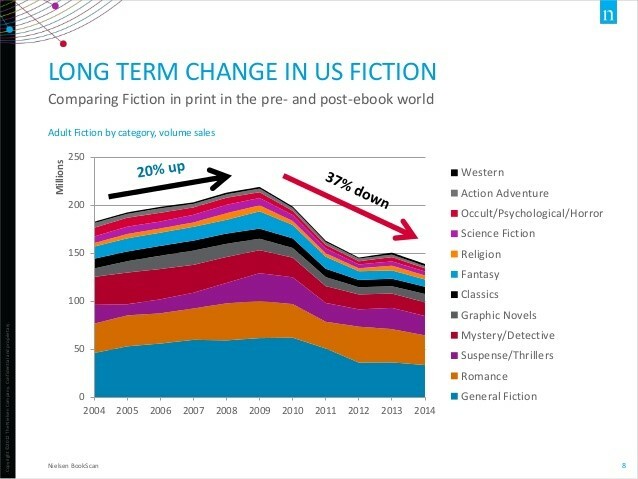 As a result of that disruption factor the historically non-dominant sector – the moderate and conservative authors started getting real traction with audiences OUTSIDE the cons for the first time. Not of course through the left-controlled media, but through increasingly popular blogs, twitter, Facebook. This has been a massive disruptor too. The big 5 no longer can prevent balkanization on their side too. That’s history and background. The result of that politically dominant position has been mirrored in editors buying choices – which authors were bought, which authors were heavily promoted, which authors got book-tours etc. The left owned 90 of the authors, 99.4% of publishing, and sold to 100% of the audience. Anyone who wasn’t left, sold only to what of the well wasn’t poisoned, and could not counter it. Now the proportion of the demographic of the US that self-identifies as left wing has reached… 24%. [http://www.gallup.com/poll/188129/conservatives-hang-ideology-lead-thread.aspx] For ease of calculation I’ll be generous and call that 25% or one quarter or one in four readers. I know it is really fashionable and ‘cool’ in NY publishing circles and among their camp followers to say “well the other ¾ don’t read and certainly can’t write. They’re stupid, need our leadership and to be told what is good for them.” It’s also really, really suicidal for the industry to say this, and not supported by any empirical evidence. And believe me – they’ve tried to find or manufacture it. Really? Reading isn’t evenly distributed, I would agree. But then neither are political affiliations. And neither is having children. And neither – most importantly — is buying books. Welfare mums may well read, and so may their kids, but they don’t have a lot of disposable income. Those rainbow-haired loud movers and shakers of literary scene… how many kids have they got? If they have one, that’s a lot. More likely they have a hamster, and hamsters don’t read much. And yes, if they have a child they will buy books for him/her/it. But ‘fertile’ and ‘future’ are not words that go together for this group. Meanwhile, the moderates and conservatives working/middle class tend to have kids, and especially in flyover America, read, and have the money to buy books. That’s who will turn up for the future. It belongs to them. Anyway, that aside: it’s the medium term that really is the issue. Let’s talk about the finite pie. 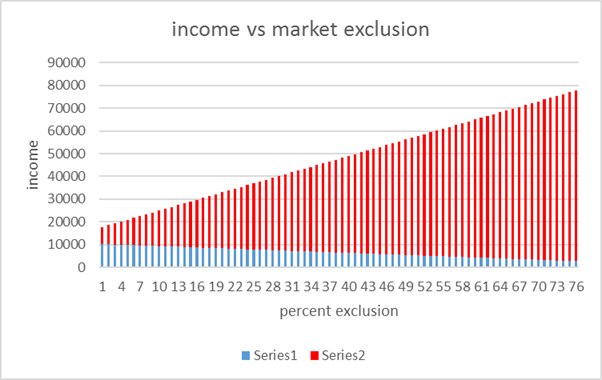 There is the assumption that there’s a specific size pie of money from people buying books, which is divided between producers (authors), publishers and retailers. As all of them have expenses, let’s keep it at gross income. Except they don’t. The moderates and right wing authors suffer much the same discrimination as at the Hugos. The left 25% of the readers don’t buy many, if any, books that don’t come from the 9 left wing authors. People like Irene Gallo of Tor Books and Damian Water of the Guardian have openly denigrated non-left wing authors as ‘bad writers’ and ‘awful writers’. Their ideological friends believe them absolutely and won’t touch anything that doesn’t bear the imprimatur of Left Approval, and even some outsiders are affected by this torrent of abuse. So the one moderate/right author has the table further skewed against him, in that only the 75% he comes from will buy his books – and with buyers faced with 10 books, he would sell to 1/10 of 75%… but the 9 sell 1/10 each to 100% of the audience. So you might express the division of the $100K as $7500 for him (call him Red), and the others (call them Blue) getting $10 000 each + (1/9 of $2500) = $10278. That was the status quo 10 years back. Like-for-like authors any moderate/conservative author earned less, as well as having less support, less markets, less publicity, less awards, less reviews… just less. It was like racing with handicap weights – you had to work a lot harder to get the same result. No I don’t think any of us went to patreon to bleg. In the last few years that has slowly begun to turn. Firstly, Amazon provided an outlet that wasn’t dependent on traditional publishing. And, secondly, ever so slowly, readers started to apply the same discrimination – but in reverse. “I only buyBaen books” – I’ve heard that a lot. (I am starting to hear ‘I only buy Castilia or Indy’ too). The financial reality is harshly the opposite. Let’s start with the assumption that a mere 5% of customers decide that they are not going to buy books from the 9 left wing authors. The pie is still all spent. So… instead of Blues getting 10K each + (1/9 of 2500) they get $9500 + (1/9 of $2500) =$9778. But… Red still got his $7500 – but he ALSO got sales from 9 Blues 5%, who had each given up $500 (Yes, Some of them had been his customers all along. Some had not. We’re using these numbers as proxies and simplifications.) So his income is up nicely, to $12000. That’s a nice 60% for Red… and for Red’s publisher. Blues get 9722+(1/9 of $2500) = $99 999.78 each. Red gets 7500+(278*9) = $10 002. Of course you have given Red 30% increase in salary by attacking him. And you have NO counter move. No redress, no lever, because you’ve already applied the full force of that. What are you going to counter it with? A threat not to buy Red’s books? Too late. False media slurs against Red? Too late. Trash talking his novels? Too late for all of it, you’ve done all that. And at 2.78% he hasn’t even STARTED punishing you for it. He still has another 72% for total separation to go. 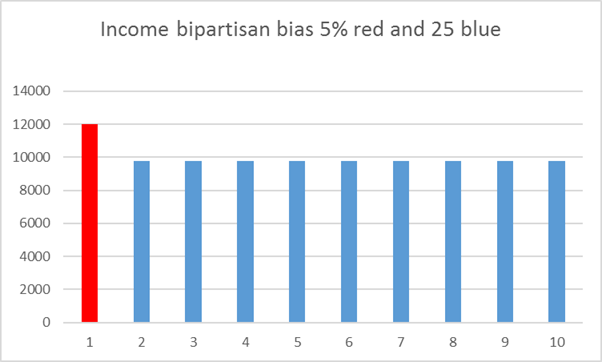 And it only gets worse, fast (or rather, better for Red, worse for Blue). Of course in the real world, publishers stop selling Blue books or go out of business. And Blue authors find it not worth it and quit. Either way, if they were one of your favorite authors, you lose, thanks to the brilliant leadership of the puppy-kicker faction. Most of the authors whose lives are trashed – will be the rank and file. The leadership who got them into this mess, will not be affected, and knew that. If you were on the other side of the equation – a Red author or reader – well, more Red authors will soon join in, so comfort yourself with the loss of your Blue colleagues, with a better paycheck. I’ll personally miss some of them, but… they didn’t step up to help me. I know: their ‘friends’ would have turned on them instead. And there are still people out there who say Vox Day is stupid, and PNH, Scalzi, Jemisin, Hines GRRM, Glyer, Gerrold, Gallo etc are clever and ‘helping’ the left by dividing the field, by driving people out so they will not buy sf or fantasy from certain sources? And this is a good thing, getting rid of anyone but the left? 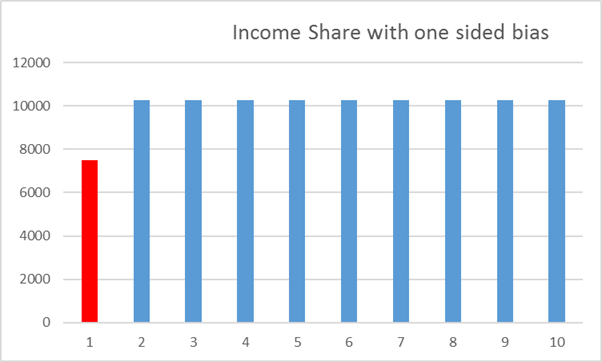 You can quibble trivial details about the numbers – and I’m sure Camestros will, despite the fact that I’ve said that they are indicative examples not actual numbers, but no matter how you fiddle about – the five key drivers remain the same. 1) The left wing have largely reserved the left wing market for themselves while selling to everyone. 2) While this part of the demographic remains smaller than the center and right, it will always be worse hurt by a response in kind. They only survive by NOT eliciting this response. 3) As Left wing NYC editors have disproportionately bought authors with whom they sympathize and identify, even only a small counter-response (the effect spread through a few authors) – will be very lucrative for right-wing and centrist authors AND their publishers. 4 ) The Left-wing authors and their publishers and camp followers have no counter-boycott to threaten in response, because they’ve used it already. 5) Independents and new small publishers are going to take any gaps that this creates, exacerbating their problem. Cure, and bringing the field back together, was always going to be hard. Given the ‘Bad Actors’ (a new SJW term for people you don’t like – or in my case, trust) in the upper echelons of the Trad Publishing establishment, who basically have everything to lose if the ship changes direction, I would say impossible. There is nothing tangible in it for the right or center to give ground without the left abandoning all 25% exclusivity – and even then, that window to do that in is small. Yet… If the ship doesn’t change direction soon it is going to hit the iceberg. But at least they’ll be at the helm. I’m glad I don’t own shares in traditional publishing. And if I was a Blue author, I’d start quietly moving towards the lifeboats and just happen to have my lifejacket (friends on the Red Ship and lots of scurrilous stories about Blue editors to tell them) handy. I foresee, very clearly, very soon, where authors will get punished for the public political stance of their publisher or editor. I think this particularly likely if the left wins the next election in the US. As I’ve said before – losers are bitter losers, without vast grace in victory, and I can’t see that grace. I expect the losers (either way) to widen the gap. One thing that is for certain: there is no further compromise nor help coming from me, anyway. Unity would do the field good – but it has to be across the board – with them dealing entirely with their exclusion FIRST. So, to those on the left of the equation: If you suddenly don’t want to Balkanize the field after all, seeing as it is a death-wish – don’t mouth pieties about unity. We’re not interested. Show us by real measurable actions. Deal with those we think are extremists and unacceptable. Show us how it is done. When the apartheid state in publishing, cons, awards, critical acclaim, change… we may believe you. Oh, in the nature of an experiment I have put A MANKIND WITCH on Kindle Unlimited. I am curious to see how many pages get read. The picture is a link. The Real World is not a laboratory. If it were, we could control for single variables. Trying various things in marketing ebooks is a case to point. (1) Last year’s Labor Day Sale, organized within this group, which had very few books on it, so potential readers weren’t overwhelmed by the sheer number of books, plus it was widely shared. (2) I released four titles in quick sequence, all in September. Then one in October, and one in November. (3) Amazon started the KULL. So, how about this year? (1) No big promos. Minimally hyped—facebook, my LJ page, and a mailing list. (2) New titles published in February and March. (3) A “Summer Reading Blitz” of four books released from the middle of June to early this month. Roughly three weeks separation between books, squeezed tighter when sales spiked and died. It picked up my badly sagging sales and got them back to what I consider my average. And then they kept selling. But since you can’t duplicate an economy, have the same distractions (Politics! Outrage! All! Day! Long! ), get Amazon to do something that might have people taking a chance on an unknown author . . . nor repeat the biggest variable: Different books . . . it’s a tough comparison. So my conclusions are . . . dubious. Yes. Dubious is a good term. (1) Forget summer, for multiple or big releases, if you want a large spike to get you some visibility. 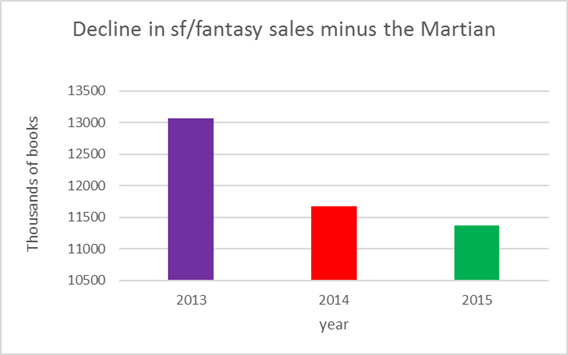 (2) But the sales will trickle in, as dedicated fans get back from vacation. (3) Multiple releases work best at weekly spacing. (4) I should work at expanding my very small mailing list. (5) I should go back and read the marketing advice here, and follow it. Now one take away from this marketing experiment is that releasing several new things in a short time works. But however I peer at it, my main conclusion is that I have still not broken out of my usual circle of readers. To do that I’m going to have to force myself out of my comfort zone, both socially and professionally. Attend school board meetings. Pay attention to local and state politics and contact them when I have something to contribute. Get back to writing letters to the editor. Attend some of those museum things I keep getting invites to. And look around for other venues where I can be helpful and spread name recognition. Write in other genres. Urban Fantasy/Paranormal Romance and MilSF are selling well, and each would be a small first step out side my usual habitats. When, all things considered, I’d rather crawl back into my introvert’s retreat of a house and write as the Muse dictates. But, if I’m going to write as a business, I’ve gotta do it anyway. That will be my next experiment. After the usual suspects came up empty when I asked for blog topics last night, I found myself wondering just what to write about today. It would be easy enough to do a riff on the “outrage” over Neil Gaiman’s Clarion tweet. But that’s been done by better folks than me (waves at Brad). I could do a post on critique groups but, again, it’s been done before by several of us here. So what to do, what to do? Then I came across the latest kerfluffle in the industry. Once again, there’s a debate going on about whether or not author’s should be paid royalties for used book sales. I touched on the topic earlier but it seems that this is the topic that won’t go away, at least not right away. So, here is the question: should authors be paid royalties for used book sales? Kristen Lamb comes down on the side of paying royalties for used book sales. (Edited to add: while Ms. Lamb does not specifically say this, I felt it was inferred. As always, I leave it to our readers to go see what she had to say and make their own decision.) It seems Ms. Lamb was up in arms over the fact that “like TEN writers” had linked to the Washington Post’s article about the resurgence of used bookstores. Worse, those writers were excited by them. Her biggest issue with used bookstores is that writers don’t get paid for books sold through them. She goes on to say that if she does buy a book through a used bookstore, she does her best to also buy the digital version so the author gets money. Her main point, if you haven’t already guessed, is that writers should be paid for their product. Now, I like getting paid as much as the next writer. I’m not in this to suffer for my art. I have bills to pay and animals that really do start looking at me funny if they don’t get their kibble on time. But, as nice as it sounds to be paid for second sales, I’m a realist as well. It’s hard enough to get actual sales numbers from traditional publishing without worrying about how they will account for used book sales. Let’s face it, authors right now are only getting paid for books it is estimated are sold and it is going to stay that way as long as publishers use services like BookScan to tell them how many books are sold at certain stores and then — thanks to handwavium — this is how many books we think were sold system-wide. So, say you do get through a clause in your publishing contract that says you will be paid for second sales of your books. How is that going to be handled? How many mom and pop used bookstores are there out there? Are you going to require them to put in the hardware and software necessary to scan every book that comes through their doors and then upload that data to some central server — ala BookScan — so publishers can then figure out what the royalty amount should be? Next question: if you do that, are publishers then going to try to put limits on what the price for these used books might be? After all, publishers aren’t going to want to be left out of this equation. Neither are the agents. Do you see what I’m getting at? That royalty you, the author, were looking forward to is now a pittance of what it might have been because of all the other folks with their hands out. Question the third: if you start tracking used book sales, will that impact the definition of “in print” for conversion purposes? All of that is something to consider before we, as authors, start making demands where used bookstores are concerned. But there is more. As I said, I’m not in this business just to give away my time and my work. This is my job just as much as it is my calling. If I wanted to just write, that’s what I’d do and I would return to the corporate world. After all, I spent years writing for my own entertainment and then shoved all that work under the bed, or in the closet or used it to build bonfires. Then someone — Sarah — applied pointy boots to my posterior and I haven’t looked back. I like the money I make from this gig and I like it when people tell me they have read something I wrote and enjoyed it. Getting those emails or PMs asking when the next book comes out gives me warm tingly feelings. However, I recognize that used bookstores serve their purpose. Much like libraries, used bookstores allow people who either can’t or won’t pay new book prices to discover the work of authors they hadn’t tried before. We might not make a few pennies in royalties from that “sale” but we gain something else: word of mouth. That is our most important and powerful form of promotion. If someone likes something we write, they will tell their family and friends. Those folks, in turn, may very well buy one or more of our books, be it in print or digital. These same used book purchasers do still leave reviews on Amazon and other sites. That, too, is important. Sure, they don’t show up as “verified purchasers” but a good review is always something we should welcome. Eric Flint has addressed this issue at length and, while he and I might not agree on a lot of things, this is one topic we are pretty much in agreement on. Go take a look at what he has to say. Now for the promo, because I am in this for the money. For those who have been following my blog, you know that this last two months have been busy ones for me. I’ve managed to publish two novels and put a third up for pre-order. Honor from Ashes (Honor and Duty Book 3) is now available for pre-order. Release is set for April 18th. Slay Bells Ring is a mixture of mystery and romance, with the emphasis more on mystery. This is the book that forced me to write it. And finally, Nocturnal Challenge, the fourth book in the Nocturnal Lives series. are available individually or as the Nocturnal Lives “boxed set”.) are also available.